I know fried food is not exactly healthy, but there is something about that crispy outside and moist, tender inside that I can’t resist. As much as I love fried food however, I hate frying it. Not only does it leave a greasy mess everywhere, the unpleasant odor lingers around the house, sometimes for days. I first heard about airfryers some time ago, but after reading mixed reviews, I held off on purchasing one. These small appliances “fry” food using hot circulating air instead of oil so you can enjoy fried foods without the mess or guilt. I really thought this sounded too good to be true. Recently I was offered an Avalon Bay Deluxe Air Fryer – AB-Airfryer100W to review and I had the chance to find out if it was. Much like a convection oven, the Avalon Bay Deluxe Air Fryer – AB-Airfryer100W uses a heating element and a high-speed fan to circulate hot air. This fan technology removes the oil from food by allowing it to drip through the basket. The oil is then lifted from the drip pan to give the food an even coating throughout the cooking process. This ensures the food cooks evenly and gives you crispy, delicious results with much less oil. Since I was skeptical about the air fryer, I just had to try it out right away. I typically skip right past instruction manuals, but with this appliance, I had no idea where to start so I did some quick reading. The instruction manual was very clear and it even included a chart specifying the correct temperature and cook time for different foods. It also listed what does not cook well in the machine such as fresh veggies. Setting up and operating the airfryer was simple. Simply place the food in the basket and slide it into place. Set the temperature dial and the time accordingly. You can either let the airfryer run for 3 minutes to preheat, or add 3 minutes to your cooking time. I decided to start simple and went with French fries. I preheated the air fryer, filled the basket up halfway and set the timer. The instructions mentioned shaking the basket halfway through the cooking cycle and I did just that. This really helped the fries cook evenly as I noticed when pulling the basket out that the ones on the outside were cooking faster. I have to say that I was pleasantly surprised at the taste and texture of the fries. They were crispy and delicious! While nothing will ever compare to the taste of hot fries cooked in a big vat of oil, these came pretty darn close. The kids really liked them and I love that there was virtually no mess to clean up. My next experiment was with one of my favorite foods — onion rings and these came out great too! They were perfectly crunchy on the outside and tender on the inside. I have since fried chicken strips, tater tots, and breaded okra. I’ve been craving homemade donut holes, so I am thinking about seeing how those do in the airfryer. If you loved fried foods, but hate the oil and the mess, this small appliance is a must-have. It does take up countertop space, but for me, it is totally worth it. I like the fact that I can set the timer and move on to other tasks while the food cooks. The dishwasher safe parts also make it easy to clean. 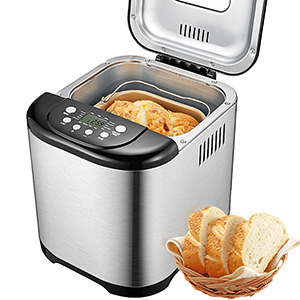 You can check out this airfryer and some other great portable appliances at Air & Water. Right now, our readers have a chance to save 30% on the Avalon Bay Deluxe Air Fryer – AB-Airfryer100W. Just enter the code BLAHBLAH at checkout! 13 Reasons To Start Traveling With Your Preschooler and SWEEPSTAKES!